If you’ve seen Exit Through the Gift Shop, then you know that some of the world’s best street art is found in Europe. And it's not just confined to billboards, either. No, walk around many major European cities, and it's like you're strolling through an art museum. You'll spot murals everywhere, from ordinary office buildings, to abandoned warehouses -- even the side of a castle. These are 12 of the most striking pieces you're likely to come across. 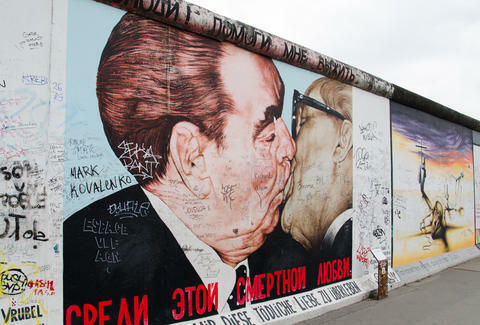 This half-mile long stretch is mostly all that’s left of the Berlin Wall. The former West side of the barricade is now an open-air gallery, featuring the work of over 100 artists -- although you’ll also see a lot of pen-and-marker tags from tourists scrawled across the paintings too. 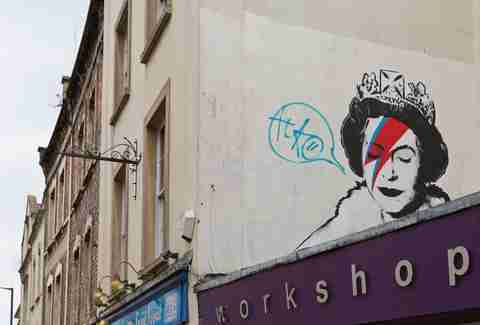 Before Banksy was doing crazy sh*t like tagging Israel’s West Bank, the world’s most famous street artist was painting on the streets of Bristol. Google has put together this map of the anonymous artist’s work across the British city, from his famous Mild Mild West to lesser known (albeit equally cool) pieces. 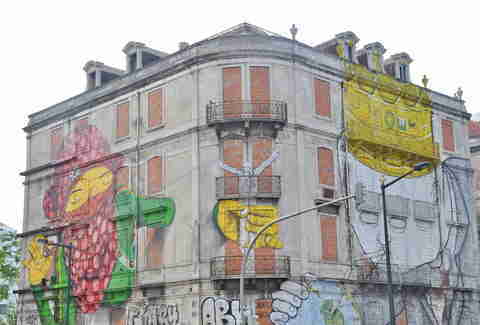 In 2013, officials had the idea to take Lisbon’s derelict buildings and turn them into blank canvases for urban artwork. CRONO was an instant success, and today the paintings of famous artists like the Brazilian twins Os Gêmeos and Italy’s BLU have totally transformed old heritage structures into masterpieces. France’s capital is known for being one of the world’s greatest cities for street art, but most people don’t realize there’s even some underground. In the Catacombs of Paris, new and mysterious murals are constantly (and illegally) popping up. 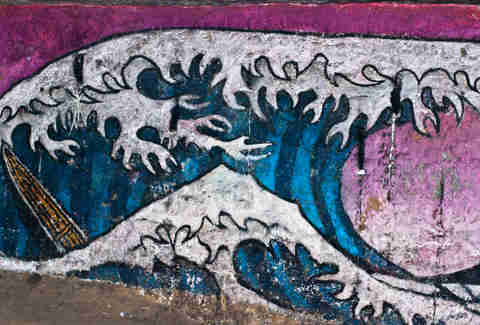 Most famous is “La Plage” (The Beach), a replica of Japanese artist Hokusai’s “The Great Wave off Kanagawa” on the walls of a sandy cave den. In 2007, the Lord of Glasgow commissioned urban artists to paint the stonework of his 13th-century castle. 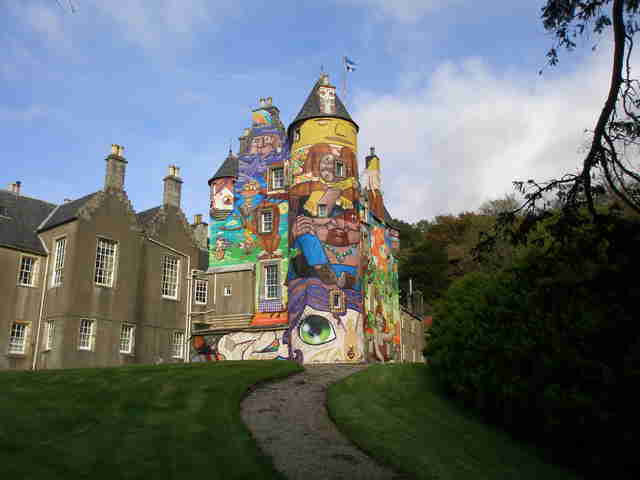 That’s how Kelburn Castle’s vibrant graffiti exterior was born, although it will legally have to be removed in just a couple years. The Hall of Fame is Lisbon’s biggest and oldest stretch of murals, and was an inspiration for the Crono Project. There are around 90 paintings in this open-art museum, located on Rue José Ferreira close to the shopping district Amoreiras. 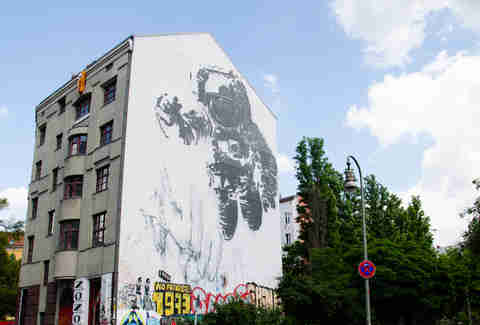 In Berlin’s trendy Kreuzberg neighborhood, The Cosmonaut (The Astronaut) is an otherworldly, 72x46-foot mural, considered to be the world’s largest stencil drawing. Portuguese artist Victor Ash created it in 2007, inspired by the Cold War space race between the US and Russia. Rome’s got plenty of murals lining its cobblestoned streets, but this ongoing project is definitely a standout. Street Heart has brought together multiple artists from around the world, including the renowned German duo Herakut and Italian artist Etnik. You can see one of the latter’s signature multi-dimensional, geometric designs displayed larger than life in the Torpignattara area. This is Prague’s most famous graffiti wall, and one of the oldest street art pieces in all of Europe. 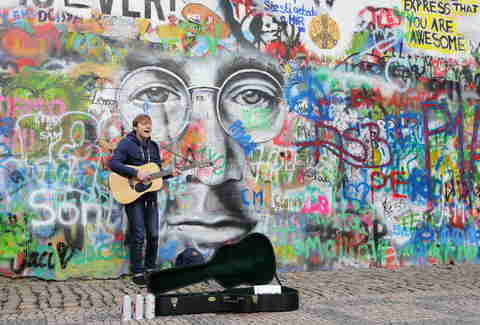 The collection of Lennon paintings and lyrics first started out during the '80s in tribute to the late singer. Young Czechs later wrote messages against the communist regime here. It’s since been repainted several times. 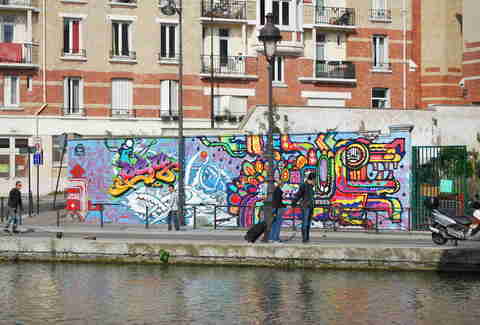 Along the banks of Paris’ Canal de l’Ourcq, you’ll find more graffiti than you can (want to?) see in a day. In 2014, dozens of urban artists painted up this 33-foot stretch, covering not just walls but even chimneys and telephone posts. The best way to see it all is on a gondola ride. 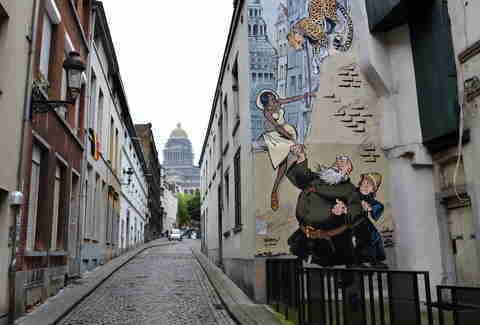 Walking around downtown Brussels, you’re likely to stumble across the Comic Strip Walk -- a collection of 50 paintings dedicated to popular Belgian comics. Olden buildings are charmingly decked out with scenes from The Adventures of Tintin, Lucky Luke, and Gaston. 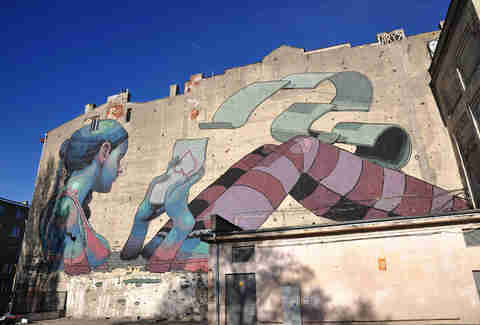 Chances are you’ve probably never heard of Lodz -- but for a tiny city in Poland, it’s a hotspot of the global street-art scene. Since 2009, famous urban artists have been invited here to rejuvenate the city’s buildings. There are now over 20 murals, not to mention various other sculptures and installations. No wonder David Lynch calls Lodz one of his inspirations. Barbara Woolsey is a Berlin-based writer who would travel anywhere recommended by David Lynch. Follow her European adventures on Facebook and Twitter.